June 6 is the Anniversary of D-Day, the massive landing of 175,000 Allied combat troops along the northern coast of France, which marked the beginning of the end of World War II in Europe. In an age before television and 24/7 cable news, it was radio that provided the American public (and the world) with up-to-the-minute coverage of the events that occurred on that fateful day. 2:00 a.m. [On Omaha Beach, the further landing of U.S. forces is suspended because of the congestion caused when the first and second waves are unable to advance off of the beach due to heavy German fire. Allied destroyers close on the beach to provide fire support to the besieged troops. On Utah Beach, a traffic jam occurs as American engineering units work to created exits in the beach barriers and seawall. British and Canadian troops as well as French commandoes have already begun moving inland from their designated landing beaches.] CBS New York (Bob Trout): It has been about 90 minutes since German radio first announced (at approximately 6:37 a.m. London time) that an Allied amphibious landing was taking place along the northern coast of France at Normandy. It is not known if this announcement is authentic or a trick intended to make the French underground reveal itself to the Germans. CBS' chief military analyst Major George Fielding Eliot speculates that, if the German reports are true, the objective might be the capture of the port of Cherbourg. [This assumption was partially correct. Other important considerations for landing at Normandy included the relative weakness of German coastal defenses in that area, capturing the important Paris-to-Cherbourg rail junction of Caen, and establishing a secure staging area that was in close proximity to Germany's Rhine-Ruhr basin.] CBS announces to the staffs on duty at its affiliate stations that it will be continuing "overtime operations" until the invasion is officially confirmed. It has been learned that broadcast an announcement to the Netherlands in Dutch that a "new phase in the air war has begun" and that civilians should move inland at least 22 miles from the coast and Dutch underground members report to their "trusted leaders." 2:30 a.m. It has been almost two hours since the first German announcement was picked up and there still has been no official confirmation from Allied Headquarters that the invasion has begun. 3:00 a.m. [On Omaha Beach, American troops have begun slowly advancing off of the beach and up the bluffs. At Pointe du Hoc, American Rangers have completed the destruction of five heavy guns that had threatened Utah Beach. Canadian and British troops continue to advance inland and have begun to subdue the towns of Courseulles and Bernieres.] It has been two and a half hours since the first German announcement of the invasion was received. Japanese radio has not yet reported that the invasion has begun. Using a microphone on a long cable, Bob Trout continues with his on-air commentary while walking through the CBS newsroom. He mentions that most of the newsroom staff has now returned to work and is busy consulting maps, monitoring London shortwave circuits etc. Unedited news reports from the various wire services are summarized and read as they come out of the teletype machines. Major Eliot comments that the 's message to the Dutch underground is "significant." 3:17 a.m. The AP wire service repeats a German announcement picked up by the about the "grand scale amphibious landing." No additional news has been heard from German Radio or the . 3:25 a.m. Bob Trout reads a bulletin to the Pacific, quoting the German announcement that the invasion has begun. There has still been no official Allied confirmation. 3:32 a.m. CBS switches to the Supreme Headquarters of the Allied Expeditionary Force (SHAEF) in London for the reading of Communique #1, a brief statement confirming that, under the command of General Eisenhower, Allied naval forces, supported by strong air forces, began landing Allied armies this morning on the northern coast of France. Via shortwave from London, Edward R. Murrow reads General Eisenhower's Order of the Day that was read to all Allied troops before the invasion began. [Eisenhower was supreme commander of the European invasion force.] Major Eliot describes the various phases of an amphibious landing operation. A report from Herbert Clark, recorded onboard one of the Allied flagships before it departed for France, is played. [D-Day combat recordings were made using special equipment that recorded the audio onto movie film. A total of 16 of these recording devices were used.] A summary of events that are known so far is given. 4:15 a.m. The known events that have occurred since first announcement came in are summarized. CBS war correspondent Quinton Reynolds comments that, for invasion participants, June 6th "will always be D-Day." He is interrupted by a shortwave report from England by John W. Vandercook who gives a stirring account of the known events that have occurred so far. In a shortwave report from England, correspondent Richard C. Hottelett describes flying over the invasion beaches in a Marauder bomber just prior to the first troops going ashore. Bob Trout summarizes the chronology of events, starting with the first German radio announcement at 12:37 a.m. EWT. He reads a statement just made in Washington, D.C. by retired General John J. Pershing, who led the American troops in Europe during World War I. Via shortwave, the summarizes known events from a British point of view. 6:11 a.m. [At Omaha Beach, American forces move inland and assault the village of Coleville. At Utah Beach, U.S. Troops move off the beach and link up with paratroopers of the 101st Airborne Division, who had landed during the early morning hours. At Juno Beach, Canadian forces penetrate more than a mile inland, and capture key bridges over the Seulles River.] Major Eliot describes the equipment and weapons being used by the invasion force. According to a Washington dispatch, Allied troops in France will be receiving hot meals by June 7th. 6:17 a.m. Bob Trout describes how New York City is reacting to news of the invasion. He remarks that he arrived at CBS in a taxi at 1:30 a.m., a little less than an hour after the first German announcement was picked up. Via shortwave from London, Charles Shaw reports his impressions of how Londoners reacted when first told of the invasion. He also describes being present for the reading of Communique #1 at 9:32 a.m. London Time. Bob Trout in New York summarizes Churchill's remarks to the House of Commons, where he first informed British lawmakers of the invasion. Ned Kalmer describes the topography of the French coast where the invasion is taking place. Bob Trout summarizes remarks made by Army Chief of Staff General George C. Marshall the previous evening at the Soviet Embassy. Marshall had left immediately afterwards since he was undoubtedly aware that the invasion was underway. German radio propaganda that has been picked up since the invasion began is commented upon. Lieutenant Colonel Victor M. Morrison from the French Military Mission in Washington describes the invasion area and provides assurances that the French underground will be supporting the invasion troops by hindering the Germans. Major Eliot compares information given out by German radio with what is known for certain. The port of Cherbourg seems to be the target. SHAEF reports that German destroyers and "e-boats" are rushing into the invasion area and are "being dealt with." A live report from the Pentagon mentions that aerial photo-reconnaissance was used extensively to plan the invasion. CBS NY repeats the essential facts that are known so far. Photo-reconnaissance conducted since the invasion began shows that Allied troops are moving inland. 7:15 a.m. Moscow has told the Russian people about the invasion. Tokyo Radio's first announcement of the invasion came during a broadcast made to Europe in German. The Japanese people have not yet been told. Elmer Davis, director of the United States Office of War Information, warns that German radio broadcasts should not be relied upon. Richard C. Harlett's description of flying over the invasion coast in a Marauder during a pre-invasion bombing mission is repeated. Major Eliot describes the various amphibious landing craft being used during the invasion and how they function. 7:45 a.m. It is announced that French General Charles deGaulle has just arrived in England from Algiers and will speak to the French people via radio this afternoon. Quentin Reynolds (a veteran of the Allied amphibious landings in Italy) describes typical German coastal defenses. 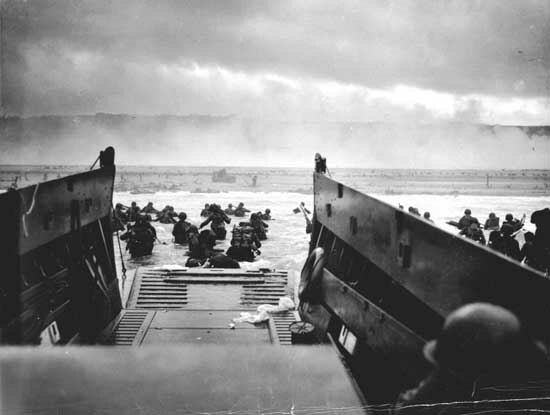 8:00 a.m. [At Omaha Beach, German gun positions have gradually been subdued and new waves of landing boats are unloading more men onto the beach. At Juno Beach, Canadian troops are moving south towards the town of Reviers.] Richard C. Hartlett summarizes the remarks that Churchill made to the House of Commons earlier. Via shortwave, Stanley Richardson gives an eyewitness account of pre-invasion naval activity. (The opening of his report is marred by poor reception.) The has reported that two beachheads have been secured and that troops are advancing inland. Major Eliot comments that the establishment of two beachheads is "big news". An attempt to reach two correspondents in England is unsuccessful due to "technical difficulties." Alan Jackson reads comments from New York City's morning newspapers about the invasion. In a pool broadcast from London, Stanley Richardson repeats his eyewitness account of naval activity during the opening phase of the invasion. (The PT boat in which he was a passenger had to return to England before the bombardment began.) Merrill Muller comments that General Eisenhower spent part of the eve of the invasion visiting with airborne troops and briefing reporters. Quinton Reynolds comments that the lessons learned during previous amphibious landings were used on D-Day. He specifically refers to the [August 19,] 1942 landing by Allied forces at Dieppe, France, which was a military disaster. 9:00 a.m. [At Pointe de Hoc, U.S. Rangers have assumed defensive positions and are awaiting reinforcement. The British advance towards Caen is stalled by heavy German resistance. Hitler has finally agreed to release the SS Panzer divisions that he had been holding in reserve.] Douglas Edwards: beachheads are established and troops are moving inland. American battleships supported the invasion. Casualties among the airborne troops have been reported as "light." [In fact, the paratroopers sustained heavy losses on D-Day and in the days that followed.] Edwards summarizes what is known to have happened so far and reads excerpts from reports made earlier by CBS' London correspondents. The Liberty Bell was rung today by striking it six times. London: a recording made by Charles Collingwood on board an LST prior to it getting underway for Normandy the previous evening is played. (It includes upbeat interviews with American soldiers who would be going ashore as part of the invasion force.) According to Paris Radio, Marshal Petain [leader of the Nazi-controlled Vichy French Government] has warned Frenchmen not to aid the Allies. Germany's morning newspapers did not tell the German people about the invasion. Paul White in New York talks with Charles Shaw in London. Shaw describes where various CBS correspondents are currently located and paraphrases his earlier report on how Londoners initially reacted to news of the invasion. From Washington, D.C., Bill Henry reports that Pentagon strategists are pondering over what effect news of the invasion will have on the German people and on German troops fighting in Italy. Congress is just assembling. President Roosevelt is reported to have slept peacefully last night. A London bulletin reports that German radio has acknowledged that Allied tanks have penetrated a few miles inland. Major Eliot describes the typical naval support that is given to an amphibious landing. Quinton Reynolds assures the anxious parents of military personnel serving in Europe that the invasion troops are going into battle with the best weapons and equipment in history. Ned Kalmer describes how the French underground movement is structured. Alan Jackson reports that the invasion armada is the largest in history. [More than 5,300 vessels of all kinds were involved.] Quinton Reynolds talks about Eisenhower's invasion broadcast to the people of Western Europe. 1:00 p.m. [At Omaha Beach, engineers are clearing a path for vehicles through the Coleville Draw. At Gold Beach, British troops have advanced to the outskirts of Bayeaux. At Sword Beach, the German 21st Panzer Division is forced to withdraw for lack of reinforcements.] CBS World News: Quincy Howe speculates as to how much support General deGaulle and the French underground will be able to give to the Allies. John Daly in New York repeats a bulletin that troops have penetrated several miles inland. He then reads some of the first-hand accounts given earlier by correspondents in England. The U.S. military's high command [Army Chief of Staff General George C. Marshall, Chief of Naval Operations Admiral Ernest J. King and Commanding General of the Army Air Corps General Henry "Hap" Arnold] recently immerged from the White House after briefing the President. The American people took the news of the invasion quietly. Many churches are holding special services. Joan Ellis, a 22-year old English teletype operator accidentally sent out a false announcement of the invasion three days earlier. [This might have been done deliberately so that the Germans would discount initial reports of the real invasion.] The Japanese people have been informed of the invasion via German reports. Flash from London: it has been reported that "many secret weapons" were used for the first time during the invasion. 1:30 p.m. Criso Radio Newspaper (which is immediately preempted by CBS News): following a summery of previous reports, there is an announcement that "casualties are light." [It would be years before the American public was told the truth about the number of battle casualties on D-Day. While the exact total will never be known for certain, it is estimated that between 3,000 and 5,000 Allied soldiers were killed that day, with many more wounded.] President Roosevelt spent the morning writing the prayer that he will broadcast to the nation this evening. (This prayer has been read to the Congress.) Bernadine Flynn talks about the French underground movement. CBS' New York newsroom announces that the invasion front has widened. 1:45 p.m. Military music played by a dance band. 1:50 p.m. CBS Washington reports on how official Washington reacted to news of the invasion. 3:00 p.m. [At Omaha Beach, the sight of 100 British gliders arriving at Landing Zone W, west of the Orne River causes panic among the troops of the German 21st Panzer Division. At Juno Beach, Canadian troops moving towards Caen are halted by stiff German resistance.] King George VI's radio broadcast to the British people is heard via shortwave. CBS World News: Alan Jackson filling in for Bob Trout (who is home resting after being up all night): It is reported that invasion forces are now 9 ½ miles inland and near the city of Caen. German opposition and Allied casualties have been "less than expected." Some of the propaganda being broadcast by German radio about the invasion is described. There is commentary on the how various countries – Russia, Italy, the U.S., etc., reacted to news of the invasion. 3:30 p.m. (From the Allied Headquarters in England): British Admiral Ramsey is quoted as saying that losses among naval craft were light and that there had been a noticeable lack of German reconnaissance. (This report is cut short.) From the House radio gallery in the Capitol, Bill Henry interviews various U.S. lawmakers. Congressman Al Gore from Tennessee [father of the future vice president] mentions that he first heard about the invasion while listening to a portable radio in his office during the early morning hours. He then spent the rest of the night, following the continuing radio coverage. John Daly reports that fighting is taking place in and around the city of Caen. A Frenchwoman who lived in Caen describes the city and the surrounding countryside. London: a report is heard from Howard Marshall who saw the first assault troops land on one of the beaches. (During this report, the shortwave signal is lost.) CBS NY: the latest dispatches are read. General Montgomery is reported as being pleased with the invasion's progress so far. German-controlled Vichy radio has admitted that invasion beachheads have been established and are expanding as reinforcements come ashore. 4:00 p.m. [At Omaha Beach, engineers continue clearing a vehicle route through the Coleville draw. At Gold Beach, British troops stop short of Caen and dig in for the night.] A program of recorded music (including "Pomp and Circumstance" and various Sousa marches) is heard while waiting for a shortwave report from London. German broadcasts, giving the locations where fighting is taking place, are summarized. German radio has admitted that German air resistance to the invasion was light. William L. Shirer analyses claims made by German radio. It had been first to report news of the invasion in order to establish itself as a reliable source of information. Once the Germans determine if this is the main invasion, it is expected that they will launch a major counter attack. Quincy Howe reports that the decision as to when to begin the invasion was determined at the meeting that took place between President Roosevelt, British Prime Minister Churchill and Russian Premier Stalin in Teheran in November 1943. [The Russians, who had been fighting the Germans since 1941, were anxious for the Allies open a "second front" that would force Hitler to divide his forces between two widely-separated battle fronts.] At the Teheran Conference, it was also agreed that the Allies' strategy for fighting the war would be to "beat Germany first" and then deal with Japan. Rommel had predicted that if the Allied invasion wasn't defeated on the beaches within the first 24 hours, a strategic advantage would be gained that would alter the outcome of the war. In the days following June 6th, tens of thousands of additional Allied soldiers flooded into Normandy along with seemingly unlimited quantities of tanks, trucks, jeeps, aircraft, ammunition, food, medical supplies, communications equipment, gasoline, and other materiel needed to fight a war. Cherbourg fell to American troops on June 27th, providing a deepwater port that increased the Allies' capacity for landing even more troops and equipment in France. Paris was liberated on August 25th. Less than a year later, on April 30, 1945, with Germany's major cities in ruins and the Allies closing in on his Berlin bunker, Hitler committed suicide. Germany surrendered unconditionally on May 7th and all hostilities in Europe officially came to an end on May 9th. The complete CBS June 6, 1944 broadcast day (available inexpensively in the MP3 format) provides a unique opportunity to relive one of the most profound events of the 20th Century as it was taking place. 65 years after they aired, the news reports, commentaries, and eye witness accounts still have the power to convey a sense of the here and now, while providing many fine examples of radio news reporting at its finest. Whether you're a military buff, a fan of "golden age" radio, or just curious about how a major event was covered back before television and 24/7 cable news, the CBS June 6, 1944 broadcast day will provide a listening experience that is as memorable as anything you are ever likely to encounter on radio. Those interested in learning more about the history of D-Day should read Stephen E. Ambrose's D-Day June 6, 1944: The Climactic Battle of World War II, which provides one of the best over-all accounts of "The Longest Day." Eric Beheim is a life-long radio enthusiast. A former commanding officer of a Naval Reserve Combat Camera unit based in San Diego. Eric Beheim leads a multi-faceted career as a free-lance writer, professional musician, and owner of his own music and sound project studio. Born in the first wave of "baby boomers" he grew up with radio and remains a life-long radio enthusiast. 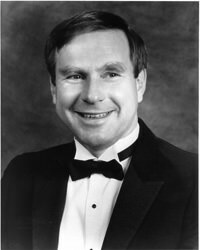 His particular interests are collecting news and commentary programs from the late 1930s and early 1940s (including World War II news), and programs that feature performances of operettas and musical theater presentations. Be the first to comment on "Longest Day: D-Day (June 6, 1944) as Reported by Radio"